The first northbound shield for I-990 was this assembly preceding milepost 1. Photo taken by Jeff Morrison (07/01/07). Interstate 990, the highest-numbered Interstate highway, is metropolitan Buffalo’s Lockport Expressway. The commuter freeway connects the greater Buffalo area with the State University of New York at Buffalo (SUNY Buffalo) and the city of Lockport as part of a four lane corridor using New York 263 and 78. AASHTO approved the designation of Interstate 990 on November 14, 1980 as the first project for the Lockport Expressway started.1 An extension from New York 299 (North French Road) northeast to New York 263 (Millersport Highway) was later approved by AASHTO on April 17, 1993. 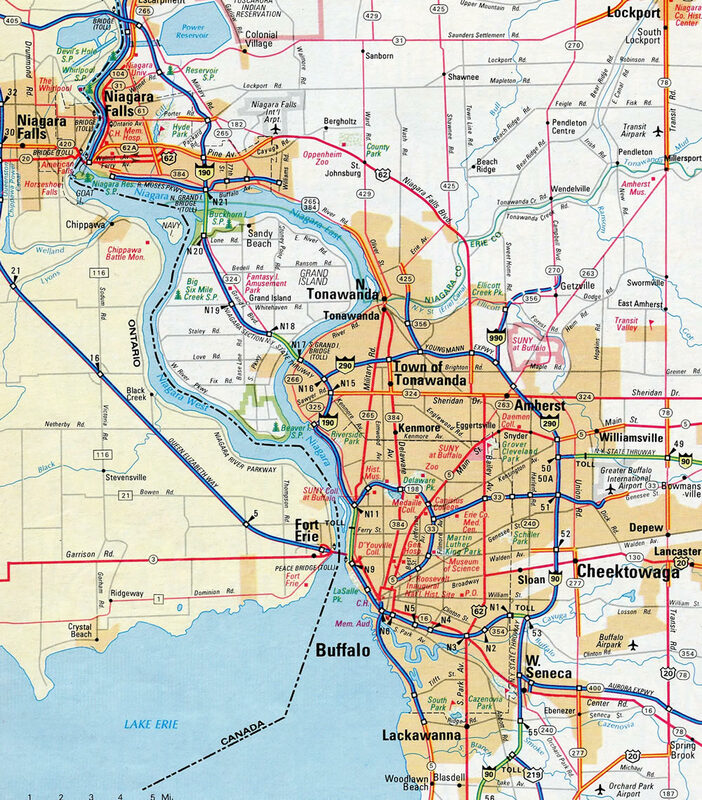 The National System of Interstate and Defense Highways Requests on file for additions to the Interstate System on March 30, 1970 included the unconstructed 66.3 mile route linking Niagara Falls with Rochester. The same request designated a 12-mile corridor for the Lockport Expressway. As the lofty population projections for Niagara County never panned out, the route east to Gasport was never fully realized. Interstate 990 under construction from Sweet Home Road east to New York 270 in 1984. Interstate 990 veers northeast from French Road to end at New York 263 (Millersport Highway) in 0.75 miles. Photo taken by Jeff Morrison (07/01/07). The final quarter mile of I-990 north takes Lockport Expressway east along side CrossPoint Business Park and below Hopkins Road. Photo taken by Jeff Morrison (07/01/07). Exit 5 takes all remaining traffic along I-990 north to New York 263 (Millersport Highway). Concrete barriers shunt traffic onto the off-ramp ahead of a roadway stub left over from the aborted plans to extend Interstate 990 north closer to Lockport. Photo taken by Jeff Morrison (07/01/07). Interstate 990 ends at a half diamond interchange with New York 263 (Millersport Highway). New York 263 continues three miles northeast to a terminus with New York 78 at Millersport. Downtown Lockport, the county seat of Niagara County, is nine miles away. Photo taken by Jeff Morrison (07/01/07). The first reassurance marker for Interstate 990 south stands along the mainline just west of New York 263 (Millersport Highway). Photo taken by Jeff Morrison (07/01/07). Attached to a pedestrian overpass, this overhead on Interstate 990 south is the first signage for the pending conclusion of the short freeway spur. This panel shows the lane allocation for directional T interchange with Interstate 290 (Power Line Expressway). Photo taken by Jeff Morrison (07/01/07). Interstate 990 south comes to an end as the freeway splits at the junction with Interstate 290. 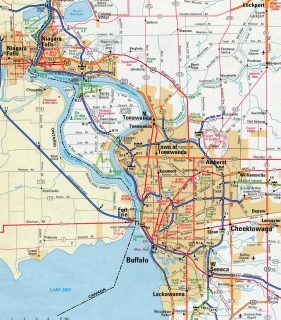 Interstate 290 serves the northern suburbs of North Tonawanda and Tonawanda to the west and Amherst to the south. The New York Thruway (Interstate 90) is four miles to the east. Photo taken by Jeff Morrison (07/01/07). Leaving the full cloverleaf interchange with New York 263, I-290 (Powerline Expressway) quickly approaches Exit 4 with Interstate 990 north. Photo taken by Chris Elbert (07/06). Interstate 290 west passes under Maple Road as Exit 4 departs for I-990 (Lockport Expressway) north to Lockport and the University of Buffalo (UB). Photo taken by Jeff Morrison (07/01/07). Two lanes leave I-290 (Youngmann Expressway) west for I-990 north just beyond the Sweet Home Road underpass. Interstate 990 runs between a number of apartment complexes just west of the UB campus. I-290 extends west to a commercialized interchange with U.S. 62 (Niagara Falls Boulevard). Photo taken by Chris Elbert (07/06). 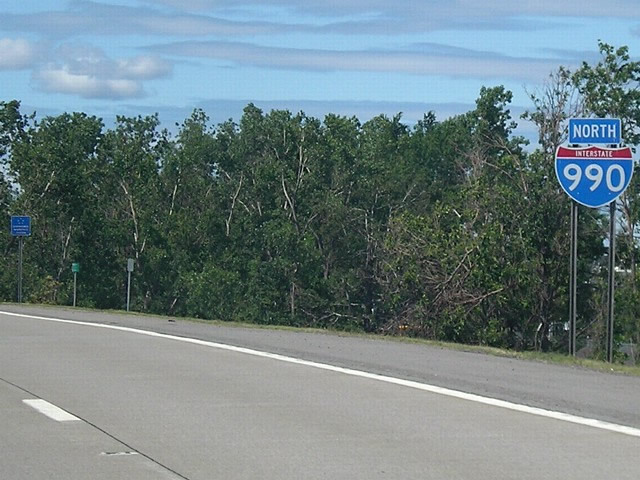 First of several guide signs for Interstate 990 (Exit 4) posted on I-290 eastbound. I-990 was the last of the branch routes for Interstate 90 signed within the Empire State. As such it is out of order in the west to east flow of numbering (I-190 and I-290 in Buffalo and I-890 in Schenectady). Photo taken by Douglas Kerr (11/10/01). Interstate 290 east enters a three quarter cloverleaf interchange (Exits 3A/B) with U.S. 62 (Niagara Falls Boulevard) just a half mile ahead of I-990. 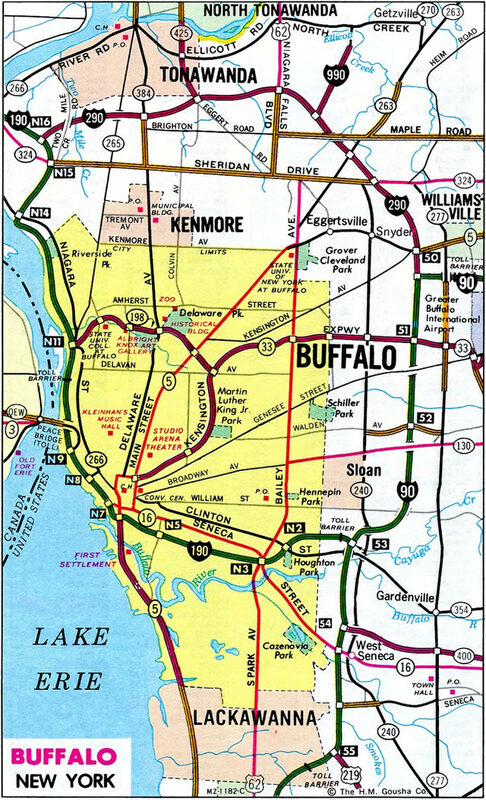 Traveling through residential and retail areas of north Buffalo, U.S. 62 receives a significant amount of traffic. Photo taken by Douglas Kerr (05/06/02). Exit 3B loops away from I-290 (Youngmann Expressway) east for U.S. 62 north. Four lanes advance to the adjacent directional T interchange (Exit 4) with Interstate 990 (Lockport Expressway). Photo taken by Douglas Kerr (10/20/02). Interstate 290 expands to five lanes ahead of the split with I-990 north. The ensuing exits from both I-990 north and I-290 east serve the adjacent State University at Buffalo (UB) campus. Sign changes made for Exit 4 made by 2007 reference the North Campus of UB. Photo taken 05/27/00. Interstate 290 east at Exit 4 (I-990 north). Lockport lies 15 miles to the north via New York 263 and 78. Photo taken 05/27/00. “Final Phase Begins in ‘Four Lane to Lockport’ Project.” Buffalo News, April 27, 1996. “Re: Was I-990 originally supposed to run east of NY 263?” online posting by cl94, AARoads Forum, August 9, 2014. “Four Lanes has enabled Lockport’s continued growth.” Buffalo News, December 27, 2015. 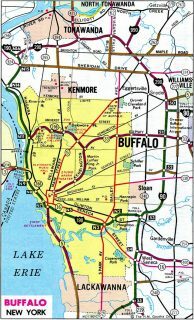 “New Link in Lockport Route to Open 4-lane Highway to Buffalo Only 2 – Miles Shy of Goal.” Buffalo News, December 20, 1990. Page updated April 22, 2016.